These boards are solid panels and made out of the above mentioned products, and can be used to insulate most parts of your home. They are mainly used on verandas with no ceiling where a large amount of heat penetrates and make the outside area very uncomfortable. Another common place foam board is used in suspended ceilings, often in offices, buildings schools. It has a much better R-value than the typical rhino ceiling board used but the R-value still is nowhere near bulk insulation products like fiberglass, polyester or cellulose fiber. If you use foam board with bulk insulation you will achieve an excellent R-value from the combination of the products. Liquid foam, or more commonly known as spray foam, has quite a few benefits. It is easy to use this insulation on those hard to reach places, it forms a good vapour barrier unlike cellulose fiber which is hygroscopic and means it can absorb water from its surroundings. It also has a great R-value. The insulation can either be sprayed directly on to the area, or injected or poured into place, depending on the area needing to be insulated. 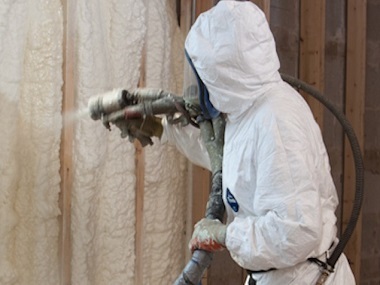 Spray foam insulation has excellent thermal and acoustic properties like fiberglass and polyester materials. It is also a very good insulation when it comes to resisting air or water.